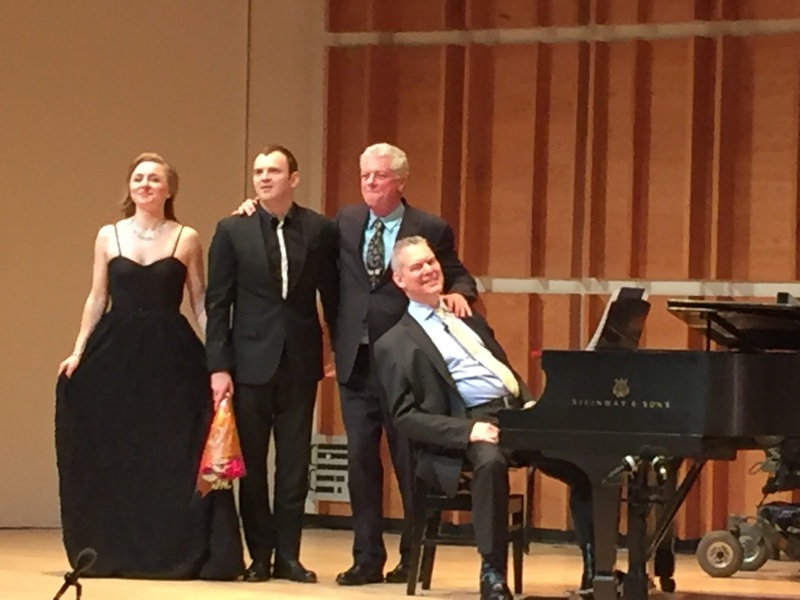 It defied our prediction that no one would show up for New York Festival of Song last night because of the torrential downpour. As a matter of fact, every seat was filled! Was it because of Artistic Director Steven Blier's fascinating insights about Pyotr Tchaikovsky? Was it to hear two Russian speaking singers interpret his gorgeous songs? All of the above? We cannot say but that's what drew us out in weather that begged for a cozy night at home. We were so glad we went! Both soprano Antonina Chehovska and baritone Alexey Lavrov are amazing artists and we have reviewed their recitals frequently and with great pleasure, as well as witnessing their well-deserved awards. We have enjoyed their performances in several languages, but the prospect of hearing an evening of Russian was too exciting to pass up. Although Tchaikovsky's ballet music was probably the first classical music we were exposed to and loved, we confess that we did not always enjoy Russian vocal music. It is always easier to appreciate songs and operas in languages that one speaks and understands. But after countless recitals at Juillliard and hearing the luscious music of Rachmaninoff we have developed an appreciation for the unique sounds and rhythms of Russian, even if we pick up only a word here and there. We understand "love" and "night" and now we know the word for "nightingale". Very useful! Tchaikovsky's music is passionate and tender and yearning. Mr. Blier's fascinating comments about the master's sexual orientation and need for secrecy in late 19th c. Russia gave us valuable insights. The stories about the women who were important in his life lent meaning to the way Onegin spoke to Tatiana in his opera Eugene Onegin. The circumstances of his death were also revealed. This made the music even more accessible than it was before. The program also included songs by his colleagues Anton Rubinstein, Anton Stepanovich Arensky, and Sergei Ivanovich Taneyev. There was not a boring song in the bunch. The theme of silence in the face of love and desire was a most important one. Of course, Tchaikovsky did not write the texts but he chose them to set and poured his heart into them. Spared the difficulty of mastering a foreign language, both singers were free to connect with the material and share that connection with the audience. We were spellbound. Ms. Chehovska was particularly marvelous in the gorgeous melody of a lullaby in which we heard a most exquisite messa di voce. Her encore was a lovely light-hearted serenade. Her voice melded beautifully with Mr. Lavrov's in the duet by Arensky "All is quiet in the enchanting night". What a songbird she is. We should use our newfound knowledge if you will forgive us our phonetic spelling of the word for nightingale. She is a "sah-la-vay". Mr. Lavrov was at his best in Onegin's aria in which he confronts Tatiana about her rash outpouring of feelings for him in the letter she had written the night before. It was a very valid interpretation of Onegin's character, one with which we totally agree. No, the eponymous hero is not a heel; he is being as honest with Tatiana about his feelings as she had been about hers. He would have been a heel to have taken advantage of her! Mr. Lavrov's encore was the very funny song "Tchaikovsky", composed by Kurt Weill with lyrics by Ira Gershwin and popularized by Danny Kaye. It gave him the opportunity to show his comedic chops. It's a good thing the evening ended with a lullaby and a laugh because the last song on the program was the master's final song and it is a dirge-like text about being alone and sad. Piano accompaniment was handled by Mr. Blier and Michael Barrett. We enjoyed the way he brought out a repetitive motif in the bass line of the lullaby sung by Ms. Chehovska and some rolling thunder we heard in the Taneyev song "Restless heart".